- A smarter way to cut signs. Quickly produce signs the way you want them. Design directly in ProCut or use Corel Draw, Adobe Illustrator or any other graphics software. Control exactly how every color will be cut. Save time, money and vinyl. Use any cutting plotter you like or continue to use the one you have. Free Internet support to get you started! Adapted for Corel Draw X8, Illustrator CC and Windows 10. With ProCut 8 plus you can create the complete sign in one software. The program has all the design and layout tools that you need. You can also open bitmap graphics or scan logos and convert them into cuttable vector graphics. News and articles about ProCut. Now there is a smarter way to cut your signs. New functions for optimized copies and automatic rotation let you cut more signs from every vinyl roll without any extra effort. 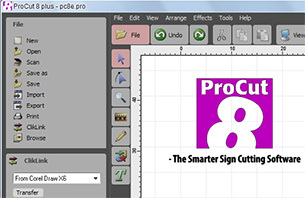 The new ProCut 8 is also adapted for Corel DRAW X8 and Adobe Illustrator CC and it runs in the new Windows 8. ProCut 8 can read graphics from most Illustration and design software, including the new Corel Draw X6 and Adobe Illustrator CS6. The ClikLink™-function that can move graphics between programs with only one click can now be used with these two programs. The program is also adapted for Windows 8 so that you can use ProCut on all of todays PCs. - Automatic rotation. You can save 50% of the vinyl with one click. - Optimized copies. The software calculates the optimal placement and rotation for sign copies. - More vinyl editing options. - Device drivers for several new cutting plotters. - Supports more communication ports. - Import capabilities for graphics from Corel Draw X8 and Illustrator CC. - ClikLink™, move graphics to and from the new versions of Corel Draw and Illustrator with one click. (ClikLink™ also works with the 64-bit versions). 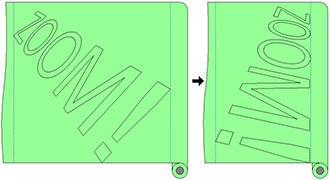 Copies are automatically placed and rotated for a minimum use of vinyl. 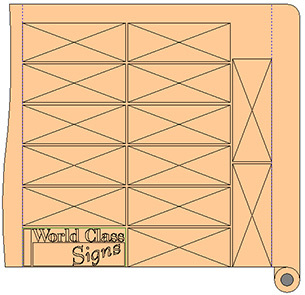 With Automatic rotation, you can cut every sign with a minimum use of vinyl. New cutting plotter drivers are being added continuosly in ProCut. In this list you will find all current models that are supported by the software. If you do not find your cutter in the list? Please contact us and most of the time we will be able to add the cutters that are requested.